Do you like pecans? What about candied pecans? Pecan pie? Pralines? Bourbon? Sugar? I am just going to assume you said yes to at least one of those things. 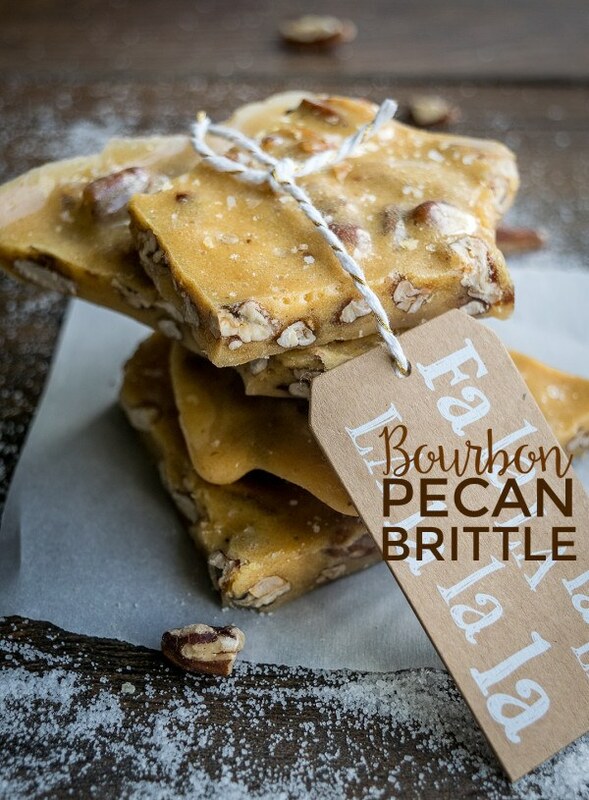 And if you did, you MUST make this pecan brittle for the holidays! Brittle is a pretty easy candy to make for as a holiday gift, dessert, or party favor. For the past couple years I have made a huge batch of peanut brittle and handed it out as a gift or brought it into work during the holiday season. This year I wanted to try something a little bit different. And now that I have been in the true South for a few years, pecans and Bourbon seemed totally appropriate! If you have never made brittle before, it might seem a little daunting, but its about as easy as making caramel. You start by boiling sugar, corn syrup, and water for a few minutes until it starts to turn a light brown. Then you mix in the nuts and keep boiling until the sugar turns a deep amber color (or reaches 300 degrees). At that point you mix in the vanilla, bourbon, salt, baking soda, and butter. Then you pour it out onto a baking sheet and let harden. Oh yeah, I also sprinkled a little sea salt on top because it just felt like it needed that extra depth of flavor. Once it was hard, I broke it into small pieces. This brittle is pretty thick, so it was hard to break with my hands. That's when I broke out the hammer. I took another piece of parchment paper and laid it on top of the brittle and whacked it with they hammer. After that, it was easy to break into pieces! I will definitely be handing this pecan brittle out to just about everyone as a Christmas gift. I have already given it as a hostess gift to several people, and I will be bringing a huge bag in for my coworkers this week. It is just a little bit unique and not your average peanut brittle, but it combines flavors that most people already love! Line a large rimmed baking sheet or jelly roll pan with parchment paper. Spray parchment with baking spray. In a large sauce pan, corn syrup, sugar, and water to a boil over medium high heat. Boil for 3 to 5 minutes without stirring until the sugar starts to slightly brown, or it reaches 240-260 degrees. Stir in pecan pieces. Allow mixture to boil for another 5 to 10 minutes until the sugar mixture turns a dark amber color, or reaches 300 degrees. Once sugar mixture gets to 300 degrees, immediately take off of heat and stir in vanilla, Bourbon, baking soda, salt, and butter. Stir until butter is completely melted and sugar mixture has turned a light honey color. Poor sugar mixture onto prepared baking sheet and spread out so that it is evenly coating the pan. Sprinkle the top with a couple pinches of coarse sea salt. Allow to cool for 30 minutes to 1 hour. Once hardened, break into pieces. Store in an air tight bag until ready to serve.